Claim "SIGNATURE SUITES. 23, Younis Bashorun Street"
Signature Suites is uniquely situated in the heart of Victoria Island in Lagos. Nigeria’s foremost business district with its popularity for its sights and sounds. The hotel is located close to all major shopping areas, embassies and corporate headquarters. 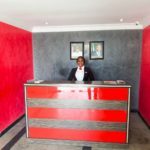 Signature Suites offers 5 Platinum Rooms, 7 Gold Rooms , 10 Royal Rooms and a Meeting Room all fitted with Air-Conditioning, Satellite TV, Laptop connection and appropriately furnished to ensure comfort and convenience for both business leisure GUESTS.